Ready Player One marks the return of Steven Spielberg to a full blown sci-fi world and it is a very fucken long time coming. The guy does fun Sci-Fi adventures like none other and this is proven further here as Ready Player One is an absolutely incredible movie from beginning to end that had me completely sucked into the world, its characters, and the world within the world; the OASIS. The film revolves around a virtual world known as the OASIS where its creator James Halliday (Mark Rylance) has hidden an incredibly difficult to find easter egg. When Wade Watts (Tye Sheridan) embarks on a search for this easter egg he is thrust into a danger and wonder filled adventure within the OASIS. There isn’t a single minute of this movie I didn’t adore, the story is endlessly thrilling, characters are rich and loveable, the villain presence is well handled, and the 70’s and 80’s pop culture references are a perfect cherry on top. What I was worried might happen here is that the film might rely on these pop culture references to get by, but it doesn’t and they are perfectly integrated to where you don’t need to know any of the references to enjoy the movie (for the most part). I’ve mentioned it already but I’ll do it again, when it comes to fantastic fast paced sci-fi stories Spielberg manages to almost effortlessly build a world of fun and excitement that you don’t want to leave. And that’s quite possibly the best thing Ready Player One does, it has formulated a world with a story and characters so damn rich that I didn’t want it to end. I could have spent 3 hours roaming both the OASIS and the real world with these characters and been thoroughly entertained the entire way through. I’m going to constantly go back to this here point; forget the beyond awesome 80’s references because the story stands entirely on its own in immaculate fashion. It cuts back and forth constantly between the OASIS and the real world and it executes this so damn seamlessly every time and ties them together in a way that I loved every minute in both worlds. I wasn’t sure how this approach would work out as with each switch you’re going from seeing the real actors to an in-game avatar. So if the two variations of each of the characters felt disconnected it would be hard to really buy into and invest in any of them and their stories. But this is as far from the case as possible, the film swaps between the two worlds enough to where there is a strong obvious personality link between the two versions where the character development is crossed over with phenomenal execution. The characters are absolutely the highlights here as no matter who the story is following and who Wade is interacting with in either world every person feels real, unique, and has a story you can get behind or at least buy into. I adored a number of the main characters but the dynamic between Wade and Art3mis (Olivia Cooke) is the best character story in here. The team dynamic between the protagonists is at the forefront of the main plot and it makes for an insanely fun ride with plenty of light humour to go along with it. And the execution of the villain in here I thought was great, he wasn’t too over the top, wasn’t campy, and I actually enjoyed watching Ben Mendelsohn in the role. Additionally it’s the strength of the performances behind the roles that makes everyone so damn memorable. Tye Sheridan has come a long way in his relatively short career to headline this film and it’s well deserved because he is just great in the lead role. He holds his own against seasoned pros such as Ben Mendelsohn and is one of the main reasons much of this film works. He exhibits a fun, lively personality and can also delve into some emotional places as required. My favourite performance in here though is from Olivia Cooke of Me and Earl and the Dying Girl (2015) fame. She was truly mesmerising in that film and it’s the same here as she just felt so damn natural to this world and grounded in this reality that I wholeheartedly got behind her character and her totally believable decisions. Mark Rylance also has a somewhat limited role in here but his talents are put to good use as he has some seriously touching moments in here and makes you adore his character with minimal screen time. Now I’ll finally highlight the totally insane amount of fun and awesome pop culture references ripped straight out of the 70’s and 80’s spanning music, film, TV, and video games. As an avid fan of all things 80’s pop culture every little (and big) detail and reference increased my excitement level x1000. The visual references and easter eggs range from subtle to very obvious and spotting each one was just fucken awesome. I’m not going to spoil what the best reference is but there is an iconic film that has a very large presence in one section here, and it’s safe to say I lost my fucken mind when it happens. It’s so good I can’t stop thinking about how damn amazing it is. And it isn’t just the visual references that caught my attention. Alan Silvestri‘s incredible score incorporates a number of audio cues from different properties and I got genuine chills at a number of moments. Being one of the most prolific composers, you can assume one of his most popular projects will have some presence in the score…. just a small hint. 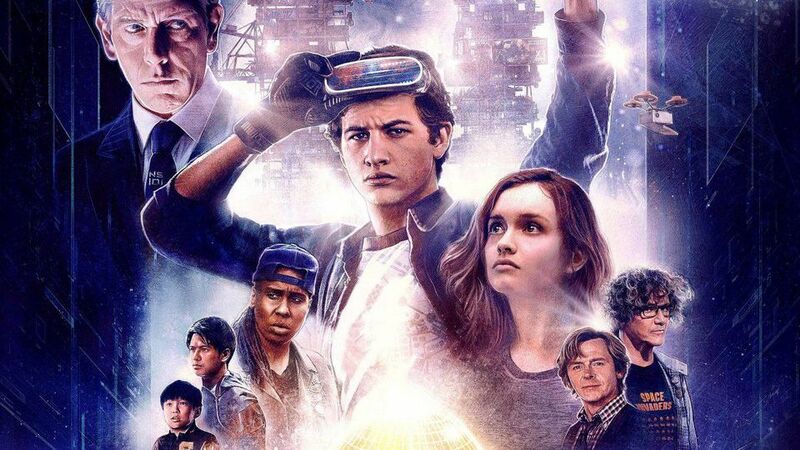 So in the end, Ready Player One is a triumphant return to the world of sci-fi for Steven Spielberg and it has made me want a Spielberg directed sci-fi film every damn year. I loved everything about it from the story to the characters, the score, the visuals, the references, music, performances…… it’s all top notch. The only room for improvement I could spot is with Mendelsohn’s villain role, I still enjoyed the part he plays but a little more depth would have been better. If you are a fan of the genre or a have a knack for 80’s nostalgia in cinema you will get a massive kick out of this movie. This is one I will definitely be revisiting a number of times in the future. OMG! I hate video games. OMG, I hate movies that are 90% CGI..OMG, I LOVED THIS MOVIE! It is so much fun…like a lot of fun! I just wish the final challenge took place on One Eye Willie’s pirate ship with Sloth swinging out of nowhere in his Superman short saving the day somehow…I mean the random “Chucky” moment was cool….but a Goonies scene would have been awesome! Oh did you think the 11 year old kid was a shout out to Short Round from Indian Jones? I think it was…I know the character’s name started with an “S”, but I think the “S” on his jacket was for Short Round….Short Round is the BEST!!!! !